Full-service carrier Vistara on Tuesday announced the launch of its bundled scheme — Vistara Freedom Fares — which will allow customers to choose the fare and services, said the carrier in a tweet posted on it’s official handle- @airvistara. Vistara’s new offering will be effective from August, 2, 2018. Under the new scheme, travellers will have the freedom to choose from thoughtfully designed bundles of features and services at different price points for their preferred flight and class of service, as stated by a press release issued by the carrier. 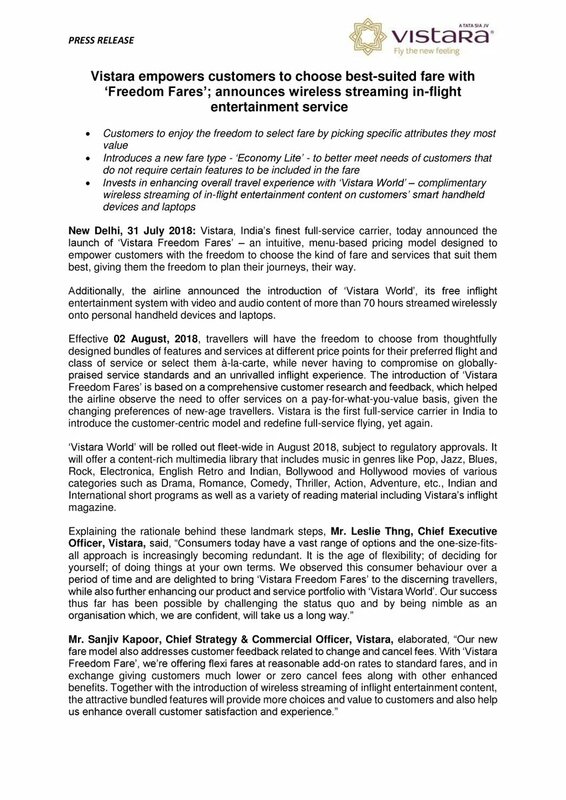 Vistara’s ‘Freedom Fares’ is an intuitive, menu-based pricing model designed to empower customers with the freedom to choose the kind of fare and services that suit them best, giving them the freedom to plan their journeys, their way, the press release added. 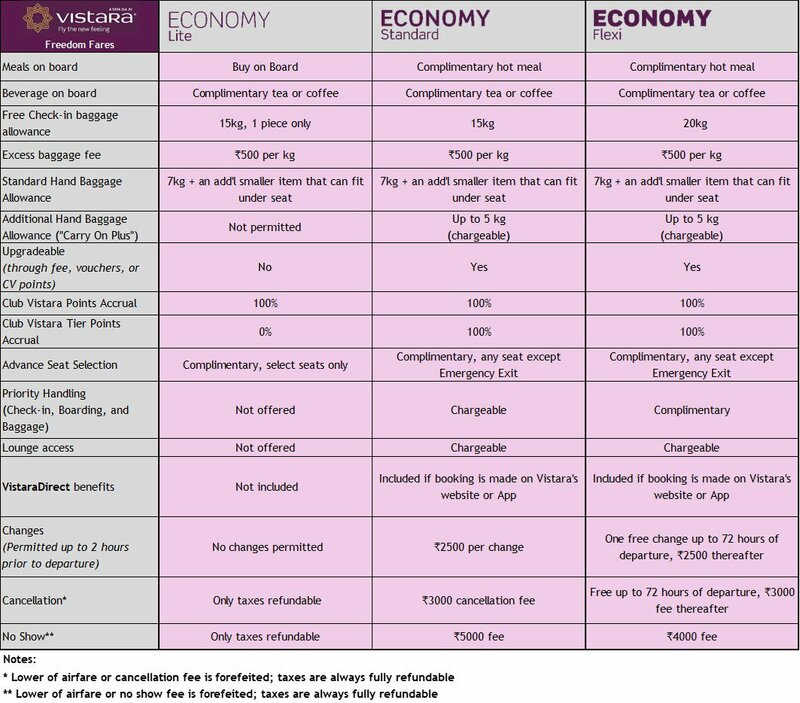 As part of ‘Vistara Freedom Fares’, economy class fares are called ‘Lite’, ‘Standard’ and ‘Flexi’, while those for premium economy and business class are named ‘Value’, ‘Standard’ and ‘Flexi’. ‘Lite’ fares will be available in economy class only, and is a new category of fares for customers seeking simply the lowest fare that does not include complimentary meals. However a buy-on-board option of snacks and drinks will be available. While ‘Economy Lite’ customers will continue to earn Club Vistara points, they will not earn elite-qualification ‘tier points’. ‘Economy Lite’ fares are not upgradeable, non-changeable and non-refundable (though taxes are always fully refundable). The free checked baggage allowance remains at 15kg, but is restricted to one piece of checked baggage only, the press release said. ‘Value’ fares are available in Premium Economy and Business Class, and are designed for those who seek the most attractive fares in these classes. These fares are essentially the same as the competitive fares available, and offer similar features as well as 100 per cent CV and elite qualification points. Changes and cancellations are possible with a fee. ‘Value’ fares are, however, not upgradeable. ‘Standard’ fares, available in all classes, are priced at a reasonable add-on to ‘Lite’ and ‘Value’ fares, and offer additional benefits such as additional baggage allowance and greater flexibility with lower change and cancel fees. These fares are upgradeable using upgrade fee, CV points or vouchers. ‘Flexi’ fares, also available in all class, are priced at an affordable add-on to ‘Standard’ fares, and offer nil change and cancellation fees (conditions apply), in addition to certain other enhanced benefits such as additional free baggage allowance and priority check-in, baggage handling, and boarding. These fares are designed for those who seek the maximum convenience and flexibility in whichever class they choose to travel, and are willing to pay a reasonable premium for it. The introduction of ‘Vistara Freedom Fares’ is based on a comprehensive customer research and feedback, which helped the airline observe the need to offer services on a pay-for-what-you-value basis, given the changing preferences of new-age travelers, said the carrier. Additionally, the airline has also announced the introduction of ‘Vistara World’, its free in-flight entertainment system with video and audio content of more than 70 hours streamed wirelessly onto personal handheld devices and laptops. Meanwhile, rival Jet Airways is introducing new flights within India at a starting price of Rs. 2,399. AirAsia India is also offering 40 per cent discount on domestic flight tickets.